Neon pillars light up the Carnival Elation's Casablanca Casino, located on the Promenade Deck (Deck 9). The Carnival Elation's casino has Slots, Blackjack, Craps, Roulette, Bingo, and Texas Hold'em for your enjoyment. The Carnival Elation also has Texas Hold'em tournaments (entry fee required) and has a progressive jackpot system on their slot machines with payouts that have reportedly reached over one million dollars. 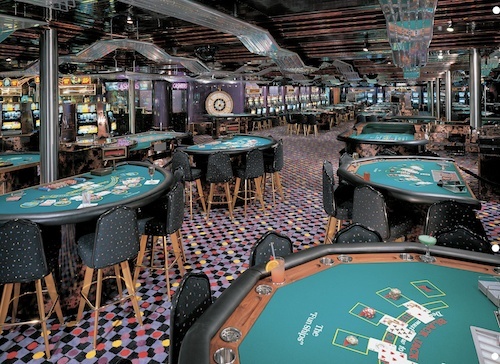 The Carnival Elation's casino typically operates any time the ship is in international waters. Gaming Lessons are offered at the beginning of the cruise and the Carnival Elation's casino staff is always willing to answer your questions if you are trying to learn a new game.